Eveline Heck­linger (center of first row) cooks for the women of Pi Beta Phi. Alexis Daniels | Col­legian. The sounds of laughter and utensils clinking against dishes floated back to her kitchen as Pi Beta Phi cook Eveline Heck­linger wiped her hands on her apron. 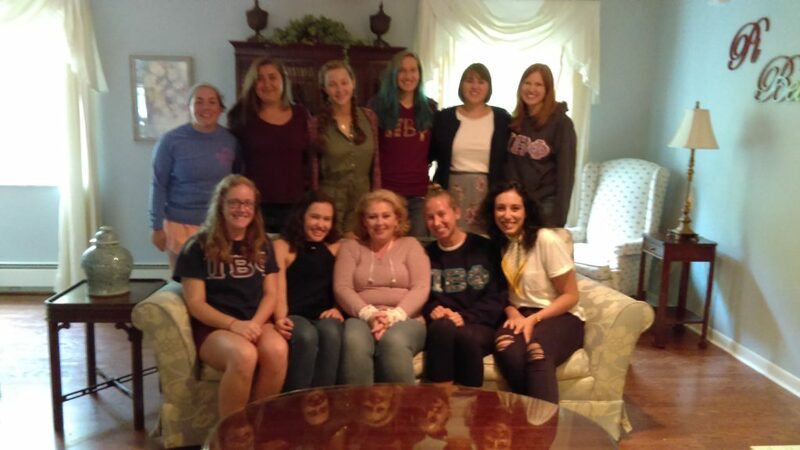 As lunch ended, the Pi Phi ladies mean­dered into the kitchen, looking for a quick snack or for con­ver­sation with their favorite cook. Heck­linger has worked in Hillsdale as a chef for both Pi Beta Phi and Alpha Tau Omega. Now, she is Pi Phi’s beloved chef and, most recently, Sigma Chi’s cher­ished house director. Even more than her tasty cooking, stu­dents say they enjoy the time Heck­linger spends getting to know them. Though she has only recently been made a house director, her ded­i­cation to the stu­dents has already allowed her to bond with the Sigma Chi boys through meals and an occa­sional movie. Heck­linger, a Polish native, spent her ado­lescent years in Germany. She met her husband online and then moved to Michigan with him in 2003, close to his home of Ohio. According to Heck­linger, “money was tight,” so they lived in a small house in Reading for two years, where they lived with their four children for two years before moving out to a ten-acre plot in Camden, where she cur­rently lives. At first, Heck­linger was a stay-at-home mom, but her love for cooking even­tually brought her to work part-time as a cook for ATO. The original plan was to open a restaurant, but after the pre­mature birth of her third child leaving her with little time to devote to the restaurant, she began to cook full time for ATO and Pi Phi. She then left ATO and stayed at Pi Phi full time until spring ’17 when she also became the house director for Sigma Chi. Between her kids on campus and her kids at home, Heck­linger is pretty busy, but she likes to read when she has time. Among her favorite works are two con­tem­porary Swedish novels that explore loss and for­giveness, “A Man Called Ove” and “My Grand­mother Asked Me to Tell You She’s Sorry,” by Fredrik Backman. She always carries a pair of wireless head­phones with her so she can listen to audio­books while she cooks. Her other main hobby has been running her own dog rescue for the past 15 summers. Heck­linger said she hopes to be a good influence on stu­dents who wander into her kitchen at Pi Phi or her apartment at Sigma Chi. Heck­linger said this stems from her childhood, during which members of her family suffer alco­holism and abuse. In the Pi Phi house, she has freedom with her cooking because she doesn’t have a set menu. Heck­linger often likes to ask the ladies in Pi Phi what they want to eat or what their dietary needs are so she can make what they like. Senior Kayla Mykeloff said after being on Wash­ington-Hillsdale Internship Program last spring where she had to cook on her own, she realized that she was missing out. But perhaps more trea­sured than Hecklinger’s meals is her company. Though senior Kaitlynn Schenk adores Hecklinger’s meat­balls, she appre­ciates the time she got to spend with Heck­linger even more. For the stu­dents in Hillsdale, Heck­linger hopes they reach out to people they wouldn’t nor­mally reach out to and learn kindness.